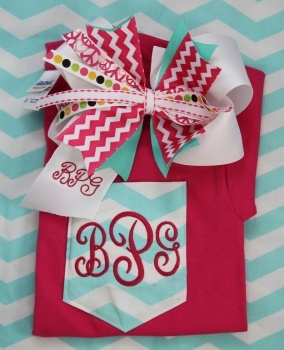 Chevron Pocket Size; 5" x 4"
Bow = 8" x 4" x 2"
Chevron Pocket Tee shirt and Chevron Bow both embroidered make a great matching set! Your little girl will love wearing this set for her next outing! The pink tee shirt will have a turquoise and white chevron striped pocket that will have her monogrammed initials in a hot pink thread. This is a curly monogram font with middle initial 2.25" high and the first and last initial are 1.75" high. For the chevron bow, the initials are in a swirl font and all initials are the same size as shown above. Embroidery is on front tail and in pink thread to match. Chevron stripes RULE!